Near-Field-Communication (NFC) Readers | GAO RFID Inc.
GAO RFID offers Near-Field Communication (NFC) readers that enable you to interact with NFC tags. NFC is a radio frequency within the 13.56 MHz band that is designed specifically for highly secure data exchange. NFC has become a standard protocol under ISO/IEC 14443 and FeliCa and is currently most popularly used in environments such as retail and check-in stations for contactless payment or smart transactions via apps on mobile devices. 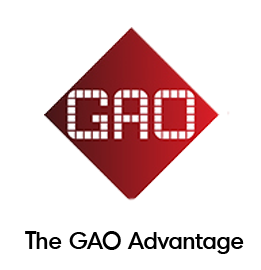 GAO RFID offers Near-Field Communication (NFC) readers that enable users to interact with NFC tags. NFC is a radio frequency with the 13.56 MHz and 433 MHz bands that is designed specifically for highly secure data exchange. These readers have R&TTE/FCC certificate and support card types like MIFARE® DESFire(4K/8K for MAD3) and L series tags . They are NFC compatible and has communication interfaces like RS232, ABA TK2, Wiegand, RS485 interface, and USB . Most of the NFC readers consist of LED and Buzzer for status indication. The remote readers are powered via standard CAT5 cable, centralized or distributed PSU topology can also be used over the network or depending on the client’s requirements. 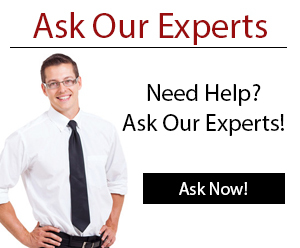 The standard data rate is 9600 to 115,200 baud rate. The readers of this kind have IP 66 and IP 50 protection standards. NFC has become a standard protocol under ISO/IEC 14443 and FeliCa and is most popularly used in environments like retail and check-in stations for contactless payment or smart transactions via apps on mobile devices. Please see our full selection of NFC readers below. 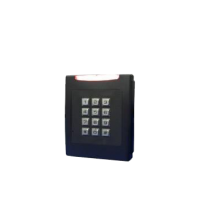 The 13.56 MHz DESFire configurable reader can read MIFARE cards as well as user inputs via its metal keypad with an IP66 protection rating. 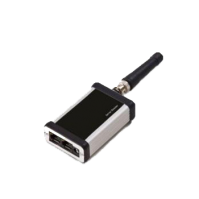 This UHF rugged reader/receiver can be configured remotely, has multi-regional flexibility, has multiple interfaces, and supports a wide variety of antennas that covers up to 490 ft (150 m).